Two weeks ago, we posted a CompanionLink Review, and about a Competition, which was very kindly offered by CompanionLink themselves. The results from the competition were very interesting, as 29 (22.8%) of you are using Outlook 2010, with 9 (7.1%) planning on upgrading, and 54 (42.5%) on Outlook 2007. You could see that our whole community are quite early adopters, as there was no-one using Outlook 2002, or 97, and just one person (0.8%) still running Outlook 2000. Going to phones, there were just four (3.1%) of you using Android, 12 (9.4%) using an iPhone,16 (12.6%) using a BlackBerry, and 14 (11%) using a Windows Mobile phone. Interestingly, 11 people (8.7%) said that they do not own a phone. These were really interesting results, and the three (randomly selected) winners have had their license keys e-mailed to them. Thanks to everyone who participated! Before, I made a review on CompanionLink Professional. 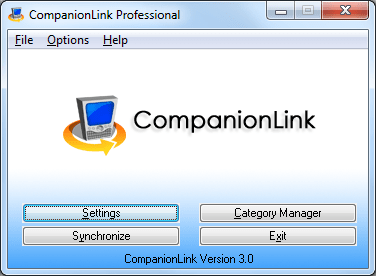 Very kindly, CompanionLink have given us three licenses of CompanionLink Professional (worth $99.95), as well as their RunStart installation service (worth $39). To enter, all you have to do is visit http://www.surveymonkey.com/s/BXKW2D6 by Friday the 21st of May 2010 (11:59PM BST), and answer the questions. We’ll then enter you into our competition, and you could win. The contest has ended, but you can download a 14-day free trial over at the CompanionLink website, by clicking here. Anyone who has not yet received a LAlarm license but commented on one of the statuses MUST e-mail lalarm@mintywhite.com by Friday at 11AM GMT, as there are still about 13 of you who haven’t come forward. Note: Entries close Tuesday, April 13th, 2010 at 11AM GMT. We have had to close it early as we have reached our limit of 100. We have previously written a review of LAlarm Laptop Security Software, and James from LAlarm has extremely kindly given us 100 business licenses (worth $5000.00 / about £3234.00) to give out to 100 lucky readers! The first 100 people to comment will be sent, by Facebook mail, a free commercial license for LAlarm (worth $50.00 / about £33). We’d also appreciate it if your comment had a suggestion for the LAlarm Developers. Please note: If you would like the license to be e-mailed rather than Facebook mailed, then comment, and then send an e-mail to LAlarm@mintywhite.com. Please include your name if it’s not obvious on your e-mail address, so that I can confirm that you have commented.